One of the best aspects of the Disney Disney Dining Plan are the meal credits. Every dining plan offers a certain number of credits per the duration of a Disney vacation. With each table service credit, you’re basically paying $30. However, when you’re dining at certain restaurants, your table service meal can run an upwards of $55 but still only count as one credit. So technically, you’re saving money by using table service credits at particular restaurants. It’s pretty awesome hack if you ask me! Below, you’ll learn about the best table service restaurants that you can maximize your credits at. Here are the 10 best one credit Disney World restaurants when you’re on the Disney Dining Plan. All you can eat buffet where servers come around to your table filled with skewers of shrimp, steak, and chicken. And let’s not forget about that bread pudding! Delight in Norwegian cuisine while being visited by Disney princess including Snow White, Cinderella, Belle, Princess Aurora, Ariel, and Mary Poppins. An all you can eat seafood buffet that screams expensive. However, you can use 1 table service credit! Enjoy contemporary American food in the presence of Cinderella, Prince Charming, the Evil Stepmother, and the Evil Step Sisters. To maximize your credits, make sure to dine here for dinner and not breakfast. All you can eat African fare in one of the most popular and highly rated restaurants in Walt Disney World. Where else can you eat food grown in Epcot’s greenhouse, in a restaurant that revolves 360, while also getting visited by Farmer Mickey, Chip ‘n Dale, and Pluto. By far the most popular character meal in Disney World that features the fab five which includes Mickey, Minnie, Pluto, Donald, and Goofy. Eat in the Beasts Castle that features 3 distinct dining rooms such as the West Wing and the main ballroom. I recommend getting the steak which is so tender, you can run a butter knife through it. And of course, try the grey stuff, it’s delicious. Enjoy delicious brick oven Italian pizza made from imported Italian water and ingredients. This restaurant is pretty expensive for what it is so it’s really important to use your table service credits here. Indulge in delicious french cuisine in a restaurant that promotes people watching (something that’s widely popular in Paris). 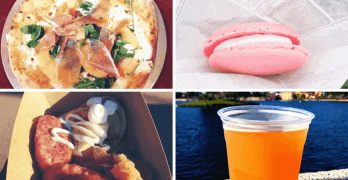 Thanks for reading and hopefully you enjoy at least one of these delicious one disney dining plan credit restaurants. I do not recommend eating at Be Our Guest. First of all, we had to order and pay from a computer and then had to serve oursleves to drinks. The price we paid I expected to be served. My daughter got a bowl of kids fruit loops for 14.00. The rest of us ordered kids meals as well due to prices higher than park meals. We left hungry. We could ordered 3 Mickey waffles at our Disney room than for the one bowl of cereal at Be Our Guest. We were told Belle and the Beast would be there is main reason for our visit. The characters where not present. I feel highly ripped off. The Beauty and Beast castle was a mini castle and was a huge disappointment to my daughter. We will not be going back. It sounds like you went there for breakfast… you should’ve checked before assuming. Beast is only there in the evening. I’ve not read about Belle being there. You served yourself because it’s Quick Service for Breakfast and Lunch, Table Service for dinner (when Beast is there). These things are published. I LOVED Be Our Guest when we went there! When we hit our 180-day mark for ADRs, that’s the first one I’ll be trying to get for this year’s trip. The lunch really isn’t more expensive than several other quick service restaurants. I don’t know about breakfast, because we don’t do breakfast at a QSR, but the prices are posted on the Disney site. But the ambiance in the castle is breathtaking. We were lucky enough to get a table in the West Wing. It totally lets you escape to a different world. The other two dining areas are beautiful. Look at the ceiling to see the angels painted on it. You just can’t go wrong at this place! Only restaurant in the list that I can’t agree with is Via Napoli. We went there last year and left before even placing our order. It is incredibly loud in there! We had problems even hearing the lady who sat us at our table, it was so loud. My 10 year old had her hands over her ears because the noise was hurting our ears. We were going to ask to be moved to a table outside in hopes it would be quieter, but once the lady who sat us left the table, we sat and waited about 10 minutes for someone to at least come for our drink order. No one ever did, so we left. Won’t ever go back there. Yes please update. We went to Be Our Guest on this recommendation and ended up out of pocket.